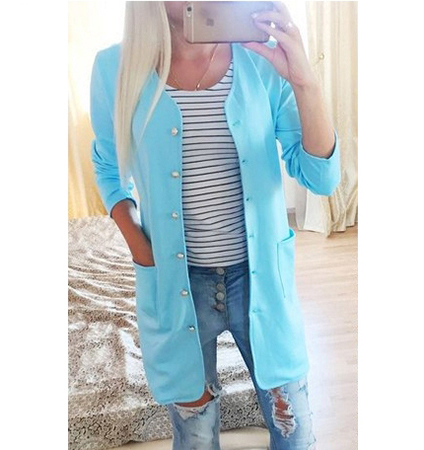 An oversized, long jacket is just what you need when you want to maintain a professional look in a garment with practical features such as this robin’s egg blue jacket. A softly curved neckline opens up to a full length buttoned front and a softly curved hem edge. All edges are carefully topstitched for durable construction and long term wear. Twin front pockets give you a place to keep your phone so it is handy and accessible when you need it. Can be worn with any outfit, casual or dressy. Small size; shoulder 35 cm, lap 100 cm, bust 90 cm, sleeve length 59 cm, total length 80 cm.